In which Coralee tells her daughters about Cairo, and the Nile Steamer. Photo from the Library of Congress. Photographer G. Eric Matson. There are so many reasons why I am longing for you and wishing you were here ready to travel up the Nile with us. We have very lovely cabins, and everything we need for comfort. We know the river trip will be interesting, and we wish you could enjoy it with us. The Lord has wonderfully blessed as we have journeyed. We have made connections at each change and if no unforeseen delays come we ought to be in Aba by December 7th. Those traveling with us are Misses Short, Cribbs, Greene and Koscher. Mr. & Mrs. Giddings flew to Kenya. 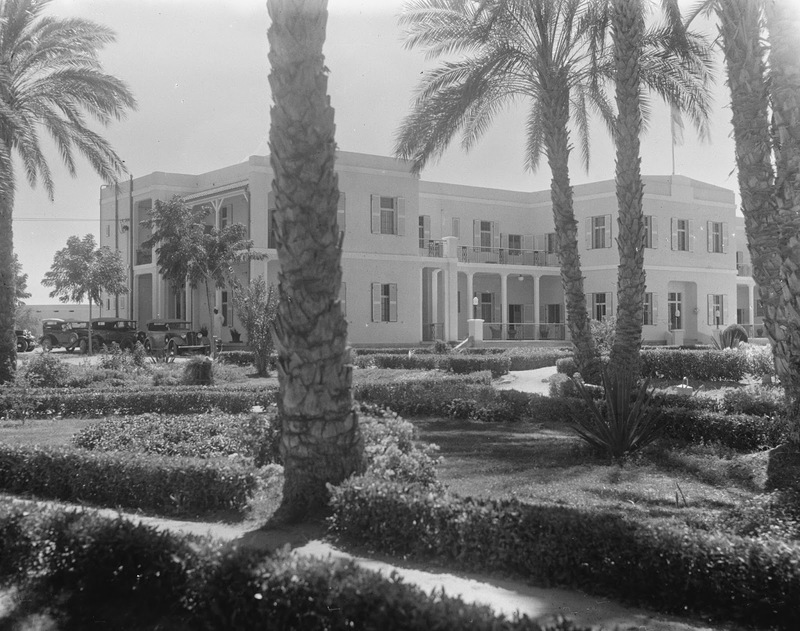 The Feltons stayed in Cairo expecting to leave in a day or two by air for Tanganyika. The train trip was tiring but interesting too. Dad will tell you details. It was so nice yesterday to reach Khartoum. The SIM folks met us at the train and helped in the many details regarding our luggage. Then we went to a hotel for lunch. While there a Greek we knew, Mr. Crassas (Parilo who took your doll, her uncle) came in . He was so glad to see us and gave us lots of news about Greek folks we know. Then he insisted on paying for all our party’s lunch. We were eight. After lunch we went to the SIM home and had a lovely visit there until train time. Our train was due to leave at 5:30. We were so surprised to find Mr. & Mrs. Sharland  and Mr. Cook from Yie (the telescope man)  traveling on to their stations. They are here on the steamer with us. It is so nice to have fellowship together once again. They left England November 10. They have had a speedy trip. Mr. Allison, the man we stayed with at Juba, went on to Juba by air yesterday. Now let’s go back to Cairo for a bit. We dislike Egypt and cannot understand why the Israelites wanted to return there. The Stoughs and Klines expected to sail on the Gripsholm from Alexandria on November 22nd. We were so happy for this definite answer to prayer. Mrs. Stough was very well and Philip was improving. They ought to get home about the days before Christmas. Our stay in Cairo cost a lot of money for everything is so expensive in Egypt. Our hotel bill for two weeks was $150. Daddy had such a busy time there seeing to all arrangements. [Illegible] and endless details enter into traveling these days. We didn't buy a single thing but post cards and stamps. Oh yes Daddy bought me a box of candy and he got a billfold, a better size for Congo money, which is bigger than American bills. Yesterday as we were coming along we saw herds of goats and sheep. The goats had long black hair, the sheep long tails, they almost touched the ground. There were lots of camels too. We didn't see a tiny baby one. The people ride donkeys a lot too. They remind me of pictures of Mary and Joseph escaping into Egypt. The Nile here is very wide and blue. It is pleasant to see the green on each bank after the bare black desert. The dust, even with the windows closed, was awful dusty and hot. We can hardly wait to get to Aba and receive mail. It seems so, so long since we heard from you. We were especially thinking of you on November 21, just a year ago we arrived in USA. Then on Thanksgiving Day we were, [illegible] last Thanksgiving and remembering all that the Lord has done for us during this year. He has wonderfully blessed and supplied all our needs and guided us each one. We hope it has been a blessed thanksgiving for you both and that you have been conscious of our prayers for you. Remember that there are those praying for you all around the world. When I read in the morning at six AM and pray for you I often think it would be 11 PM with you. Perhaps you’re weary and getting ready for bed. Then at night when I go to bed I think of you again and try to think what special needs may be yours. So all thru the days you are constantly remembered. So many folks ask about you. It makes me very proud to have two daughters like you who love the Lord and are seeking to live for Him. Now my paper is finished and so I will close here with lots of love to you. 1. She makes it sound like there was only one, but it appears there were several that operated along the Nile from various ports. Here is a wonderful link that gives a narrative of the journey from around the time that Ralph and Coralee were making this trip. Great old photographs and a map with Aba on it! 2. It is very unclear who this person is, and I'm not sure I've transcribed the name correctly. Mom does not remember the name. She does remember that when she and Edith left Congo they gave some of their dolls to various local children, and Parilo might have been one of them. 3. Very likely this was Leonard Sharland. I'm confused about the "Mrs." since Wikipedia doesn't list him as being married until 1951. UPDATE! Thanks to Roger, the son of Leonard Sharland (see comment below), I now know that the Sharlands referred to are Charles and Freda Sharland, who were with CMS in Loka, Sudan. 4. Mom doesn't remember who this person might be, or the reference to the telescope. 6. This is a reference to the obstetrical practice which Ralph was obliged to do. Mom remembers that he said that it was his least favorite specialty in medicine, and yet the one he practiced a great deal. Many of the missionary children were born at Aba. The storks were the White Stork, which migrate through Africa. 7. The time change would not be this great, so I'm not sure what Coralee was thinking here. The difference between Aba and Florida, where the girls were, would have been perhaps 8 hours. 8. I believe this could have been Paris and Marjorie Reidhead, who were traveling to Sudan-Ethiopia border to do a survey of tribal languages. See this link and this one. 9. Edie and Esther were at Hampton Du Bose Academy to complete their high school education. Mom remembers that for Christmas this year (their first in the US alone), Coralee and Ralph arranged for a $15 extra allowance for each of the girls to get a pearl necklace for Christmas. She said that those pearl necklaces were their only jewelry until sometime in college. In the end Edith and Esther didn't go to Taylor. Because they both wanted to be missionaries, and they were short of funds, they decided to take Bible training at Moody Bible Institute in Chicago. The first letter from Africa! But this doesn't seem at all like Africa, and I’m certainly glad our part is not like this. We have been in this noisy dirty hole for 10 days now and will be mighty happy when the time comes to leave it. That, we hope, will be day after tomorrow. This is a borrowed typewriter with a lazy carriage, and that, with “seek and ye shall find” typist is a bad combination. Take your choice as to which to blame for the results. The last few days before our sailing were a dizzy round of getting visas and other papers in order, for we didn't know we would be able to sail until the Friday before the Tuesday of sailing. However, the ship really sailed on the scheduled date. It was quite a rush to get aboard by 9 AM as was required, and then we didn't actually leave until 7 PM. All the way across to Naples, and from there to Port Said the sea was unusually calm, more so that we have ever experienced for so long a time. As there were around 100 missionaries aboard among some 800 passengers we made lots of new friends and renewed acquaintance with some old ones who had passed through our home at Aba years before, and we had a really good time. There was a prayer meeting every day and a Gospel service on Sundays, and morning and afternoon meetings for children. The passengers made up an interesting mixture of folks representing many nationalities and callings. Among them were some Arabs and some Jewish rabbis, and that during the trouble in Palestine; but fortunately all remained calm on the Gripsholm. There were teachers and college professors, engineers and oil people, doctors and nurses, and men on business of many kinds going to places like Palestine, Lebanon, Syria, Irak, Iran, Egypt and India. Most of the missionaries were going to various parts of Africa, Egypt, Sudan, Nigeria, Congo, Kenya, Tanganyika, Abyssinia, and the Rhodesias . Most of the others were going to places in the Middle East. It would have been interesting to know how many different languages were spoken by those on board. It certainly was a motley crowd, and that made this trip so vastly different from that of our return to the States last year where there were 5 passengers besides ourselves. Another thing that made this trip different was the very poor quarters to which we were assigned. 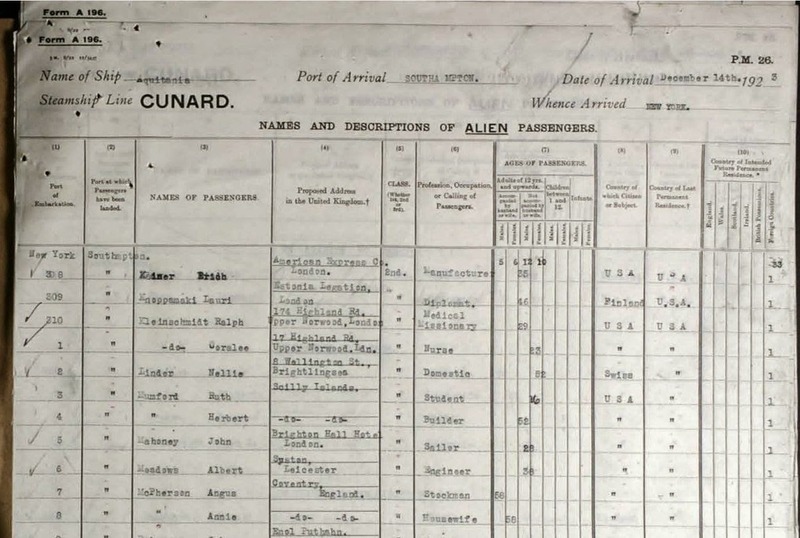 We were among the very last to be booked and so although we paid the same as all the rest we had third class cabins which were miserable holes compared with the de luxe quarters we had on the freighter. Among other minor annoyances the refugees of the last trip left us a heritage of bedbugs! But the food was fairly good and plentiful and the sea was very kind to us, and so we really had a good time after all. We reached Naples on time, but soon after arriving we learned that our ship had developed serious engine trouble, which might mean an indefinite delay. We were thankful the delay was in beautiful Naples Bay and not in the middle of the ocean, especially when we heard that a ship a couple of days behind us had had a couple of days of very rough weather – a part, probably, of the big storm that was raging around England while we were serenely sailing along around Gibraltar. 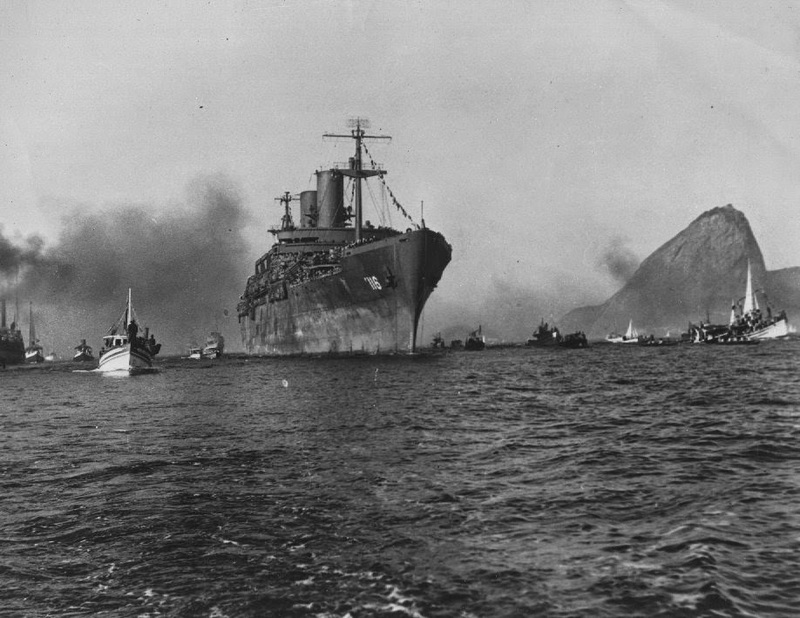 At Naples we were not allowed on shore – an order of the War Shipping Administration. But from the ship we could still see plenty of evidence of the havoc of war. We docked at the nearly ruined famous Mussolini Docks, and all around the harbor area were the remains of bombed out buildings, and in the harbor or bay quite a number of wrecked or half submerged ships. The American Army of Occupation was in evidence all around the place with their trucks and Jeeps and all manner of odd vehicles. We got into conversation with some of the soldiers who came aboard and found that one of them was from St. Louis and used to live on Lee Ave., near Grand, just opposite the car barns ! I think his name was something like Niehaus. He spoke of Eliot School and Gast the barber, and swore that when he gets back to St. Louis he will never, never leave it again. They are all fed up with Italy, and no wonder, especially in its present state of poverty, confusion and disorder. taken July 1945 in Brazil. After four days at Naples it was decided to transfer us to another ship and eventually we were taken aboard the U.S.S. Gen. Meigs, a Troop Transport run by the U.S. Coast Guard . It was a very large ship and made strictly for business, with all the fol-de-rols left out. First of all we were all herded together in a small room and given a little initiation talk. There was no “it is kindly requested of the passengers” but “you will be prompt at meal times, anyone more than 10 minutes late will miss that meal” or “you will wear your life belts at all times except when asleep; anyone caught without it will be sent to his room.” The ladies slept in rooms of about 15 beds, arranged in layers of three, and no ladders to reach the top with. This section of the ship was “out of bounds” to all men, they had to kiss their wives goodnight on deck. The men had another part of the ship for their territory. Some slept in rooms with 8 or 10 beds, but some of us chose to sleep in a “compartment” which when carrying troops accommodates around 500 men. With only about 50 using it there was lots of room and plenty of air. You were given an armful of bed clothes, chose your own cot, and made it up yourself. Every morning there was inspection, but nobody was put on K.P. The trip on this ship lasted only 4 days, as it was very fast. The Gripsholm had been scheduled to stop at Piraeus, the port of Athens in Greece, and possibly at Salonika (Thessalonia) and we were looking forward to seeing a bit of Greece even though we knew we would not be permitted to land. But the troop ship skipped all that and went direct to Port Said instead of Alexandria. At Port Said we had to go through Customs, and that was the most awful scramble I've ever seen in my life. I’ll spare you and not even try to describe it, for you wouldn't believe it anyway, and it makes me mad every time I think of it. It took us a day and a half to get 7 pieces of baggage sorted out of the pile and through Customs, and then we had to pay down a large deposit on it even though we were merely going through Egypt in transit. If we’re clever enough we may be able to recover most of the amount when we leave Egypt. When that glad day comes we’re going to join the Israelites in singing the Song of the Redeemed (Exodus 15). Why on earth they ever hankered to get back to this land once they had got out is more than I can figure out. If you ever go on a tour skip Egypt! I don’t deny it’s interesting to see the many different kinds of people and their ways of doing things. They still plow with a forked stick like their father Abraham must have done. Old Abraham surely made a mess of things when he begat Ishmael. He little realized what he was letting the world in for… Then too the pyramids and the Sphinx are worth looking at if you are nearby anyway. The only thing that’s decent is the weather, which is perfect, but they can’t help that. From Port Said to Cairo is 5 hours on the train, and on that trip we saw a number of British military camps on the edge of the desert. That certainly made us feel sorry for the poor fellows who had to live and fight here a short time ago. And some of the soldiers say Egypt is fine compared to Iran and Irak. We have been in Cairo for 11 days now and almost every one of those days I have been running around town trying to find some way to get out of here. And every day there has been frustration and uncertainty and change. But now at least it really looks as if we will leave here tomorrow evening and that we will be able to get right through to Aba without any long delays en route. We go by rail to Assuan tomorrow night and stay in the hotel there the following night. Then we go a short distance to catch the boat on the Nile which takes us as far as Wadi Halfa in the Sudan. 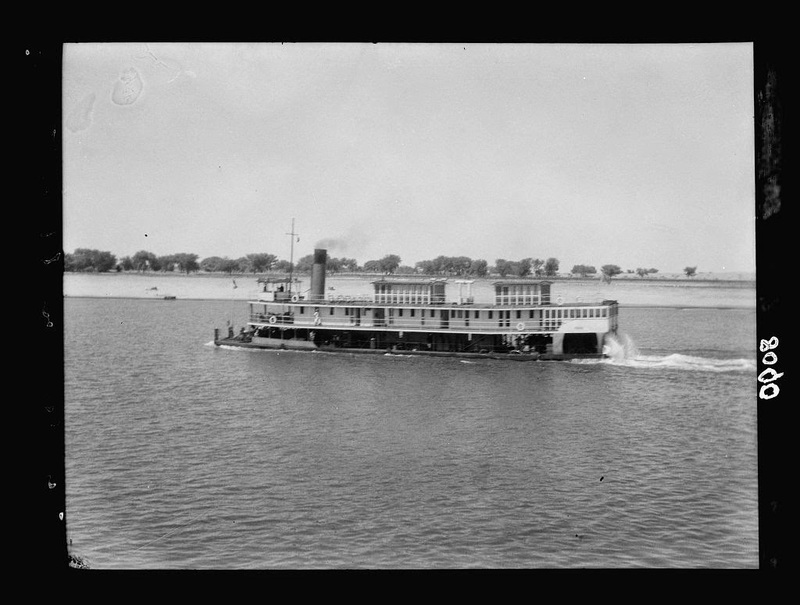 There we get another train to Khartoum, change to still another there, and go to Kosti to get another Nile steamer. From here to Kosti takes 5 days, and from Kosti to Juba takes 11 days on the steamer provided the boat does not get stuck in the floating islands of papyrus and “sud” that grow in the river. From Juba it’s only 5 hours by car to Aba. If all goes according to schedule we should be at Aba around December 8, which will be just 22 years to the day since we first sailed from New York for the Congo. Until a few hours ago it was still uncertain as to whether we would be able to get booking on the steamer that goes from Kosti to Juba. But this morning I heard that places that had been reserved for some others would be available for us. Two of our party, Mr. and Mrs. Giddings, left Cairo by plane this morning to go to Kenya, and Mr. and Mrs. Felton expect to leave by air next week going to Tanganyika. One other of our party, Miss Kosher, will go with us as far as Juba, and then branch off by another route to Kenya. That leaves only five of us to go to Congo; Misses Cribbs, Green and Short, besides ourselves. Much to our surprise, when we had our first meal in this hotel, we saw Paul Stough walk into the dining room with two of his sons. He is the man who married Rachel Winsor, who died some time last year . Paul married again recently (Miss Quackenbush ) and not long ago they started home on furlough, going down the Congo and hoping to catch the Gripsholm on its way back to America. A day or two after they reached Cairo his wife developed appendicitis, with perforation and peritonitis. An operation was done in the middle of the night, and what with penicillin and Sulfa she has recovered and is going to leave the hospital today after having spent nearly 3 weeks there. And then shortly after the wife was taken to the hospital the youngest son, aged 11, became ill with some peculiar sort of paralysis and has been in hospital ever since, unable to walk. No definite diagnosis has been made as yet, although they do not now think it is Infantile Paralysis . However, he is steadily improving, and since the Gripsholm is going to be late because of its engine trouble, the Stoughs will probably be able to catch…[illegible]… so good for the Klines who also came this way to get the Gripsholm and have been held up all this while, paying high hotel bills while waiting for it. But at that they are far better off than the Stoughs and our two weeks wait here is as nothing compared to the time the Stoughs have had. That’s all I have paper for, and about all there is to say anyway, so here we stop. Forgot to say we're well, and lonesome. Map created by George Meyers, Map Wizard. Thanks! 1. Abyssinia was an older term for Ethiopia, and the Rhodesias were Northern (now Zambia) and Southern (now Zimbabwe). 2. My mother and dad agree that this would refer to street cars, or trolleys. 3. Here is an additional source of information on the Meigs, which was laid down in September 1943, served in WW2 and the Korean War, and then while being towed to salvage in 1972, was caught in a gale and broke up on the rocks at Cape Flattery, Washington. 4. Rachel Winsor Stough died in March 1944 according to the Billy Graham archives. 5. Elizabeth Carolyn (Quackenbush) Stough. See her biographical sketch at the Billy Graham archives. 6. Infantile paralysis is an old term for poliomyelitis (polio). Phil Stough was later diagnosed with polio. I recently found this passenger listing for Ralph and Coralee Kleinschmidt on the Aquitania. This would have been their first trip out to Congo. This is the ship that got them from New York to England. They went from England to Ost-end, Belgium and there got a ship to the Congo port of Banana. Here is the link for the Wikipedia entry on the RMS Aquitania.